…Lance Priebe, Lane Merrifield, Dave Krysko, Chris Hendricks, Holly Hildebrant, Nate Sawatzky, and others who were involved with the early stages of Club Penguin. They believed that the game could do well with a lot of effort, work, and love put into this virtual world. This idea of an online hangout with penguins could have failed, but they did just the opposite of that… they succeeded and look where the game is now. …Each and every one of the employees of Club Penguin, whether they are past or present, in every department. I could go on mentioning names, but there are too many to list that I can’t thank individually. Instead, I am thanking them as a whole team. Club Penguin is alive today because of the devoted people working at the headquarters in Kelowna, BC, Canada and the other offices in various parts of the world. They chose to do an occupation at Club Penguin to support themselves and their families. They have entertained millions of people this way. …Disney, one of the world’s most well-known companies delivering entertainment through television, music, and more. They DID NOT ruin Club Penguin. In fact, they improved the game with their funding and support. The real-life merchandise (toys, video games, and more) were backed up by Disney. More word about the virtual world was spread thanks to Disney’s promotions. As a result, more people joined Club Penguin now that they were aware of it. Although I believe Disney could now spend more time and money with Club Penguin, I (and so should you) am grateful for Disney’s help throughout the years. …Finally, YOU, one of the many members of the community. How does a virtual world last a whole decade? Sure, profits from membership have kept it alive, but the genuine reason is the community. All the penguins who make up this one-of-a-kind community is how Club Penguin has been up on the web for all these years. Since the game has been an immense part of our childhood, many of us still are passionate fans, even in the teenage and adult years. We follow Club Penguin, step by step, as they go through good and bad times. Along the way, we support them by playing online, paying membership, being a fan blogger, creating fan artworks, and making videos about the game. Together, we believe in Club Penguin and continue to be proud supporters. I cannot tell how much longer the game will last. Being ten years old is already an accomplishment. How many more years can this game stay online? Because the game’s popularity has decreased and a couple of services have discontinued (like the UK, German, and Russian divisions, the Puffle Wild app, just to name a few), admittedly, I am concerned about the current status of the game. It wouldn’t be surprising if the game ended within the next years, in my opinion. I just hope that it will stay on the internet for a long time and that future generations of kids can have the chance to play it. For over 5 years, I’ve been a player and I’m not stopping now. I have had some of the most wonderful, unforgettable moments and memories in Club Penguin. Feel free to comment on this blog post of your favorite times, opinions of aforementioned content, and anything else relevant. Here’s to the next adventures and experiences in Club Penguin! See you then and as Billybob would say, waddle on! Happy 10th birthday, Club Penguin. Fan art of Club Penguin’s 10th Anniversary by yours truly. Surprisingly, Club Penguin has made this epic TV special by Disney and Factory Create available to purchase on the iTunes store… even before it premieres on television! I couldn’t wait to watch it. As a result, I have watched it already. I summarize the story and share my thoughts. Furthermore, there is a hint of possibly the fourth CP TV special at the end of Halloween Panic! and will be explained in detail at the end of the post. THE STORY: Jangrah and her friends set up a Halloween attraction at her igloo. All is going pretty swell until Blizzard comes up with his own unexpected part of the attraction: zombie penguins! It’s all just a trick though, but his friends don’t laugh with him. Instead, they disagree with his trickery. Blizzard the trick master feels left out, because his penguin pals favor treats over tricks. Feeling down, he meets Polter-Gus (or Gus, for short). Blizzard ends up being the tricked one. Gus tricks him into releasing mischievous ghosts. They want to transform all penguins on Club Penguin isle into ghosts. Scary!! (This proves that it is possible for penguins to fly.) Anyway, Blizzard is in a sticky situation. After all, he caused this spooky mess in the first place. How can he regain his friendship with Jangrah and the others as well as save the island?! Blizzard is in a blizzard of troubles. MY REVIEW: Again, Disney and Factory Create teamed up to make another awesome television special for Club Penguin fans. It’s not very scary and okay for the little ones to watch. Halloween Panic! is more of a comedy rather than horror, in my opinion. I laughed a lot throughout the special. The jokes and comedy are ace and overall had a fun, spooktastic time! I don’t have a favorite Club Penguin TV special and like all of them equally. Kudos to Disney, Club Penguin, and Factory Create for a third fantastic special. SPOILER! HINT OF POSSIBLE NEXT CP TV SPECIAL. READ AT YOUR OWN RISK. I totally wasn’t expecting this to happen. At the end of Halloween Panic!, there is a scene that is totally unrelated to Halloween, ghosts, zombies, etc. All I will say is that it relates to the EPF and Sydmull, the science fan, will be the main character of most likely the fourth Club Penguin TV special. Cannot wait!! Summer’s too hot, winter’s too cold. Spring is the season to sneeze and sneeze. I sound like Goldilocks, but it’s true. The crisp air of autumn is what I look forward to each year. It just gives me a peaceful and invigorating sensation. It’s the time of year to refresh, in my opinion. Wait a minute. How is this post related to Club Penguin? Patience, Padawan! 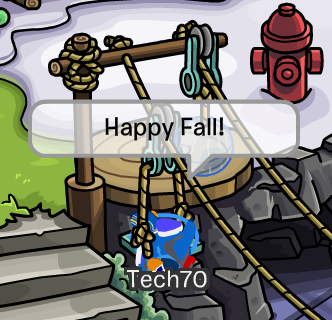 Club Penguin always seems to be awesome doing the fall. Each year, I look forward to the Anniversary Parties, especially this year because of the 10th Anniversary. Rejoicing and reminiscing of the past year makes me admire what Club Penguin has done in the year. Typically, the annual spooky Halloween Parties are a success and are fun. I prefer joining in CP’s Halloween Parties over trick-or-treating. The parties are a better treat that won’t result in cavities! What’s more, November is usually EPF month, which has an operation involving the Elite Penguin Force and the main bad guy, Herbert P. Bear and his crustacean sidekick, Klutzy. I’ve always been a fan of operations, they are some of the best events ever! Club Penguin has been hinting clues in recent times that seem to point to a new operation this November. Can’t wait. The season of fall is the rise of terrific things!